The oceans provide us with endless opportunities for adventure and exploration, moments of wonder, inspiration and happiness, and of course, without them there would be no Clipper Race. So it’s only natural that we mark World Oceans Day today, a global day of ocean celebration and collaboration for a better future. 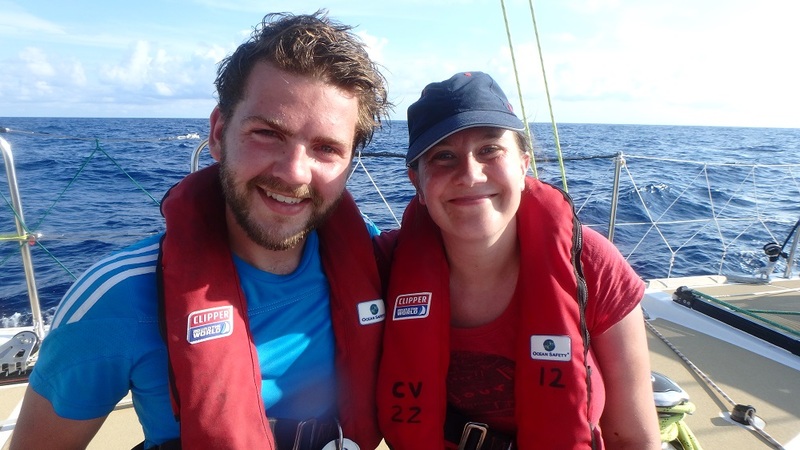 There is much more to the Clipper Race than sailing and as our crew make their way around the planet, those who weren’t there already find themselves falling in love with their life on the waves and develop a strong desire to protect the ocean and all of its creatures. This year’s theme for World Oceans Day is “Healthy Oceans, Healthy Planet”, promoting prevention of plastic ocean pollution. 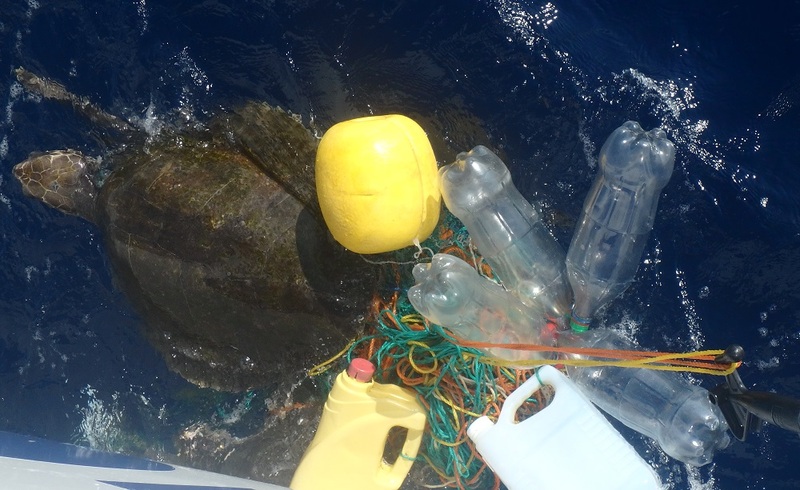 At the end of Race 10, and whilst under motor towards Costa Rica, our PSP Logistics team captured a moment that depicts the damage that is being caused to our oceans when they came across a mother and baby turtle caught in some plastic fishing nets. Skipper Max Stunell and his crew turned around and set about rescuing the pair, as the video below shows. In her own words Nicola Prince, a crew member on board PSP Logistics who was part of the rescue team recounts the events of that evening. It was about 17.00 local time, somewhere in the region of N10°29 W93°14, Colin Hammond and I saw a group of what looked like buoys floating nearby. 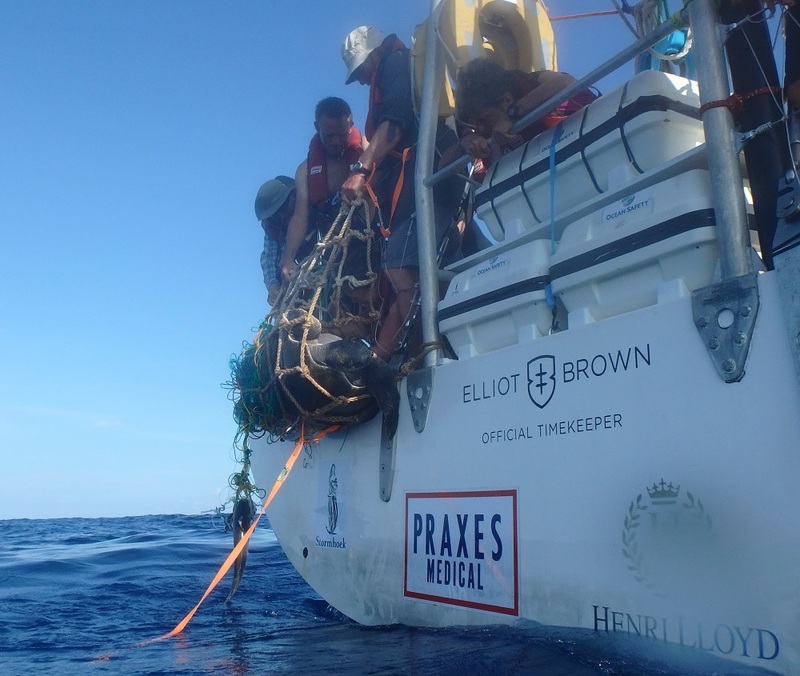 As we passed it, we saw that is was a ball of mixed fishing lines about a foot in diameter with a yellow buoy and a number of plastic bottles attached. Eagle-eyed Skipper Max saw that a turtle was caught up in this detritus and immediately turned back to investigate and the P.C.T.R.T. (Pina Colada Turtle Rescue Team) swung into action. I grabbed a boat hook and Henrik Schoenfeld readied himself to be the rescue swimmer. Everyone else stood by ready to deploy once we knew what we were dealing with. As we approached this ball of plastic evilness we could see there wasn't just one turtle but two caught up, with multiple thick plastic lines wrapped round their flippers and necks. With one being larger than the other we, perhaps wrongly in retrospect, decided they were mother and baby (a rather big baby), but for the purpose of this blog we will refer to them as such. Max positioned the boat so that I was able to snare a couple of the plastic lines with the boat hook. Unfortunately Mama Turtle was scared and tried to swim away making very difficult to hold so I was assisted by Nicola Edwards and Martin Brown to hold on. Meanwhile Henrik had readied himself with a sailing knife, fins and goggles and jumped in. He approached this mess carefully - we do not know how the turtles would react to him and we also discovered there was a small shark caught, although we quickly saw it was dead. Even with only small waves and a slight current it was difficult for Henrik to work out what was where. With a few directions from on deck Henrik managed to cut free baby turtle after about 15 minutes. The poor thing still had lines round its flipper so Henrik took it round to the back of the boat where Carolin Held could reach down and take these off. Now we had the trickier task of freeing Mama Turtle. She was far more ensnared by the plastic lines and despite Henrik's best efforts he just could not get her free. Janey England suggested we move Mama round to the back of the boat and lift her with the scramble net (which had already been lowered for Henrik). I, along with Janey, Dirk Karge, Sue Bell and Kevin Chappell went to the back of the boat to prepare the net. As we did this it struck me that I knew exactly how to rig the net, using a technique I've used for less savoury reasons in my job as a Marine Officer on the River Thames. As a team we rigged up the net as a scoop using spare tethers while Nicola, Martin, Carolin and Henrik manoeuvred Mama Turtle and her collection of plastic round to the back of the boat and in to the net. The net crew then pulled her a few feet above the water line. As we did this Mama ended up on her back and stopped moving. Initially I feared we were running out of time, who knows how long this poor creature had been caught up and unable to feed? With Mama now on her back I could reach over and start freeing her from the lines. She had two round her neck which I removed and she then lifted her head and looked up at us. I got the impression that she knew we were trying to help her and she was, in fact, laying still and allowing me to touch her. Then I cut the lines from her front flipper - there were about four or five brightly coloured nylon type ropes and one that was a very thick fishing line and really tough to cut but eventually I was able to cut through them. Then the last and most difficult task - she had up to ten lines round her rear left flipper. I had to saw and hack through these and it felt like it took forever to free them. I got through them and gently pulled them away from her flipper. After a quick check with the others holding the net we could see she was finally free. Someone pulled the ball of plastic out of the net and we slowly released her. Once back in the water, Mama T took a second to steady herself, then looked back at us as if to say thank you and then swam down into the ocean. Everyone on deck had a part to play in this rescue of two beautiful animals particularly our very dashing Henrik (pictured below with Nicola Prince) who at times resembled James Bond swimming by the boat with a knife between his teeth. I think we on PSP Logistics should be very proud of ourselves. However this does highlight the terrible affect humans and our careless use of netting and plastics are reeking on our oceans and the animals that inhabit them. The efforts of the PSP Logistics crew is certainly something to be celebrated and on behalf of everyone at the Clipper Race we would like to say a huge thank you for their actions. The ocean generates most of the oxygen we breathe, it helps to feed us and regulates the climate and covers nearly 71 per cent of our planet’s surface. 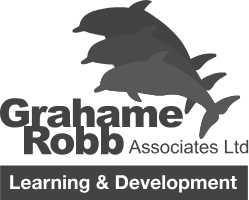 To find out more about how we can give back, check out the World Oceans Day website. The Clipper Race fleet is currently racing to New York in the Atlantic Ocean, having already sailed 37,000 miles of its 11-month long circumnavigation. During the race which started in London, crew have already crossed the Atlantic Ocean twice, experienced the Southern Ocean and also crossed the mighty Pacific Ocean. Click here to follow the race action.